I don’t think there’s anything more comforting than a steaming bowl of Tarka Daal. Creamy orange-yellow, studded with the red of the tomatoes and the green of the coriander. Peppery with cumin and tangy with ginger, you can enjoy it with a thick, doughy tandoori roti or some fluffy rice. Don’t forget to buy some mango pickle! 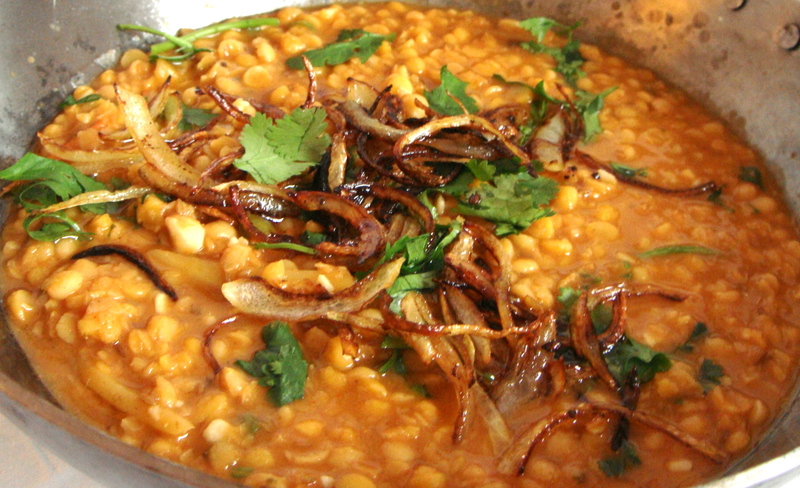 No two people make daal exactly the same way. And that’s the beauty of it. Once you get a basic recipe you like, you can add your favourite ingredients or omit the bits you’re not that keen on. Don’t be shy with the spices! The real surprise of this dish though is its simplicity. You just put everything in a pot and leave it to boil away merrily for 45 minutes. This will become your signature dish. A true classic. Wash the daal a few times, drain and then put it in a large pot. Add the 4 mugs of water. Add all the spices, the garlic, tomatoes and ginger. Bring to the boil, cover and let it bubble away on a medium to high heat for around 40-45 minutes. Make sure it’s bubbling away or it will take longer to cook. Don’t be afraid of the high heat – there’s a lot of water in there to get rid of. Be brave! Halfway through cooking, taste the cooking liquid and adjust the chilli, salt or spices if you need to. Take off the heat, add the chopped coriander. Mix very gently once. Fry the onions in a tablespoon of olive or vegetable oil til dark golden brown then scatter over the top of the daal, without mixing.